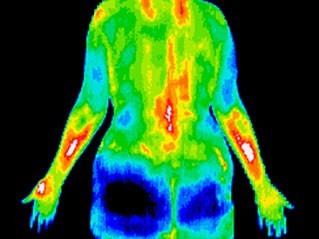 Thermography or Digital Infrared Thermal Imaging (DITI) is a non-invasive and painless screening imaging procedure involving the detection and recording of cutaneous thermal patterns using a heat- sensing (infrared) camera and a computer, which can provide visual and quantitative documentation of these temperature measurements. 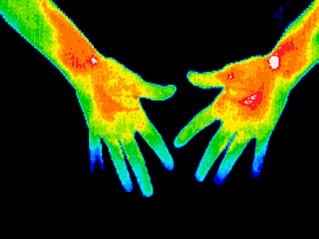 Thermography can potentially detect problems in the body before they become apparent clinically, or show sign and symptoms. 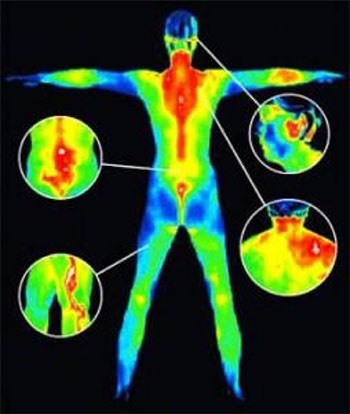 Sheryl, owner of the Vista Natural Wellness Center and ACCT-Certified Clinical Thermographer, can discuss her own previous full-body thermographic results and how they indicted the presence of what was later determined to be a rare type of Non-Hodgkin’s Lymphoma. 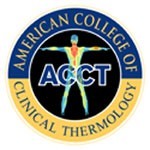 Thermography’s major clinical value is in its high sensitivity to pathology in the vascular, muscular, neural and skeletal systems and as such can contribute to the pathogenesis, of this pathology and therefore, help the clinician make a diagnosis. Screening for illnesses utilizing Digital Infrared Thermal Imaging (DITI) or simply “Thermography” is available for both men and women. Due to its exquisite accuracy and sensitivity in detecting physiological pathology (not structural) in the human body, DITI has marked value in the early detection, diagnostic help, pathophysiology and the recovery process of disease. Because Thermography is an image of the physiology that is occurring in the body and not anatomical structure, it can easily detect a developing cancer (tumor initiation), in the breast, a full 8-10 years BEFORE mammography would be able to show that same cancer, especially in women under 50 years of age, due to the higher density of breast tissue in younger women. Additionally, Thermography was approved by the FDA in 1982 as a “first- line” screening test for breast cancer. Thermography screenings can assess heart function and detect inflammation in the carotid arteries (which may be a precursor to stroke and/or blood clots). When inflammation and/or occlusion of the carotids are visible, your doctor may do additional testing. Earlier detection of a heart problem may save your life. Higher levels of heat in that region can also indicate immune dysfunction. 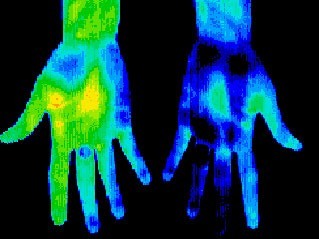 Another aspect of thermal imaging which has gone largely unnoticed is in developing diabetic neuropathies of the feet, before the foot becomes insensate, by a 1-2 degrees centigrade drop in temperature as compared to the lower leg and usually the toes are not visible to the camera as they have become so hypothermic. This can occur several years before routine blood tests indicate diabetes, and as such, can give the patient time to treat the condition before permanent nerve damage occurs to the foot. Thermography can help you detect early signs of arthritis and differentiate between osteoarthritis and more severe forms like rheumatoid. Effective early treatment strategies can then be implemented, before you experience further degeneration. 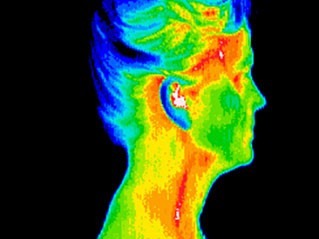 Thermal pain patterns ‘light up’ white and red hot on a scan in the involved area. You can get relief faster and begin restorative care that more precisely targets the affected area. 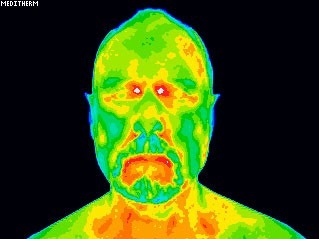 If you have TMJ, gum disease or an infected tooth, this will show up on a thermal scan as white or red hot. Significant heat in your forehead or sinus region, revealed on a thermal scan, is an indicator that these areas in your body are inflamed and not functioning properly. The immune system correlates to the T1 andT2 areas of your spine and high levels of heat in that region can indicate immune dysfunction. On the other hand, chronic fatigue, fibromyalgia and aching joints elsewhere in the body are just a few complaints that correlate to cool areas seen in this region. This condition is often misdiagnosed. 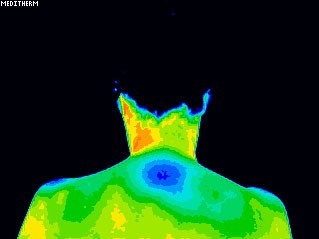 For instance, you may think you have CTS, yet the scan shows your neck is referring pain from a different affected area. This will help you receive the most appropriate treatment. Irritable bowel syndrome, diverticulitis and Crohn’s disease are often visible with thermography. If you’re able to address these conditions early on, you’ll find that restoring health is much more likely. Other conditions that can be screened for with thermography include bursitis, herniated discs, ligament or muscle tear, lupus, nerve problems, whiplash, stroke screening, cancer, and many, many others. X rays, CAT Scans, Ultrasounds and MRIs etc., are tests of anatomy. EMG is a test of motor physiology. DITI is unique in its capability to show changes in physiology and metabolic processes. It has also proven to be a very useful complementary procedure to other diagnostic procedures. We can image most of the entire body (brain is not able to be imaged due to the skull), the upper body from hips up, the lower body from hips down, or a specific region of interest such as the head, knees or breasts. Medical uses of DITI have been used extensively in human medicine in the U.S.A., Europe and Asia for the past 30 years. Contact us to learn how Thermography (DITI) can benefit you!